At Time Lines Etc. we believe that one of the best ways that we can help preserve the liberty that has made America great is to know and understand the principles described in the Declaration of Independence and in the Constitution of the United States of America. Therefore, we are presently offering a free gift. Whenever you place an order with us we will send you a complementary pocket copy of the Constitution and the Declaration of Independence. The cover features a painting of George Washington offering you, the reader, a quill pen. Would you have been one of the signers if you had attending the Constitutional Convention in 1787? Well you CAN sign the pledge on the back of the booklet. It says, "I, as one of "We, the people of the United States," affirm that I have read (or will read) out U.S. Constitution and pledge to maintain and promote its standard of liberty for myself and for our posterity and do hereby attest to that by my signature." 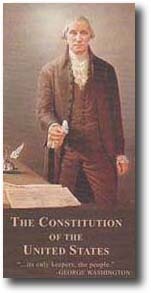 If you would like to find out how to share Constitutional principles with others, click hereto read an article called "Missionaries for the Constitution" . 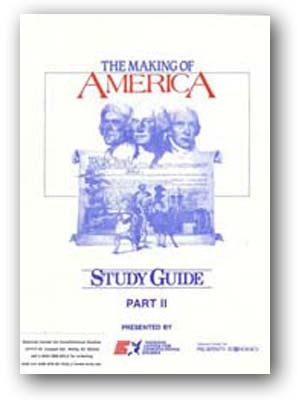 We are also adding to our product line The Miracle of America Study Guide, a well illustrated 70 page workbook that helps teach the principles of good government as outlined in the Constitution. Featured in this excellent resource are instructions on how to recite the Preamble of the Constitution using sign language. Great for helping students of all ages remember these inspired words!! An important part of preserving our liberty is being informed so that we can support candidates who understand and support Constitutional Principles. Learning about issues is also very important. Do you know what the FTAA is? It is the "Free Trade Area of the Americas." It is not an accident that we don't hear about FTAA on the mainstream media. Those who are in favor of it want to get it approved by Congress with as little opposition as possible AND they hope to get it in place by January 2005! FTAA is an expansion of NAFTA and is a great threat to American jobs and to our way of life. Instead of including only North American countries, it will include all the countries of North and South America with the exception of Cuba. To find out more click here www.stop the ftaa.org. Finally, we are please to recommend that you visit the website for the National Center for Constitutional Studies by clicking on the icon below. Here you will find many fine books that will help educate Americans in the important principles of freedom. We especially recommend The Making of America and The Five Thousand Year Leap, but are confident that you will find many other equally valuable resources made available by NCCS.